After being slightly disappointed by the eSpoir Lip Color Essence, I was a bit reluctant in trying another eSpoir lip product. But since that is one of their lowest priced lip products, it is understandable that it is not that good. 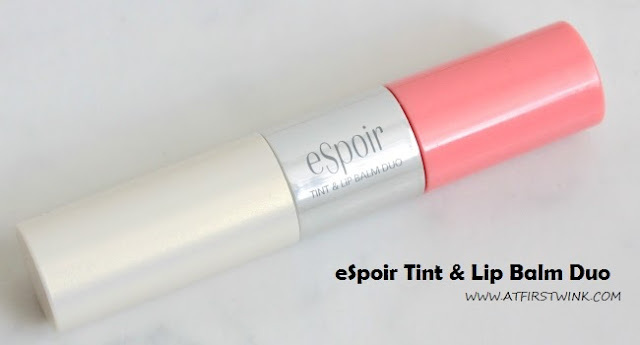 This eSpoir Tint & Lip Balm duo was more expensive, so let's see whether I liked it. 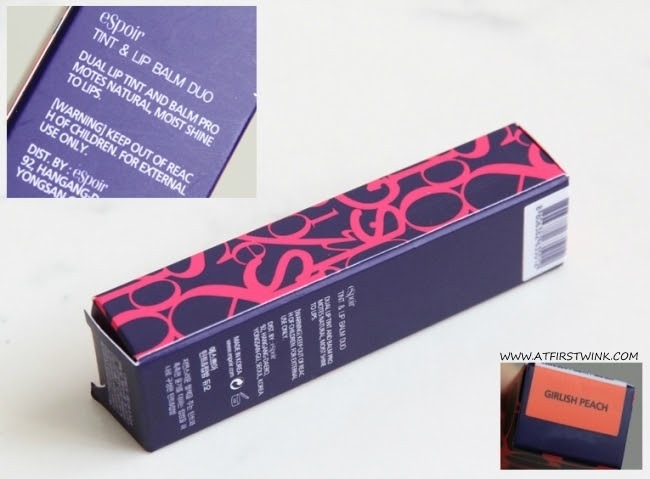 It has the same dark blue and fuchsia letter print as the eSpoir Lip Color Essence. On the top, you can find the label with the name of the color. 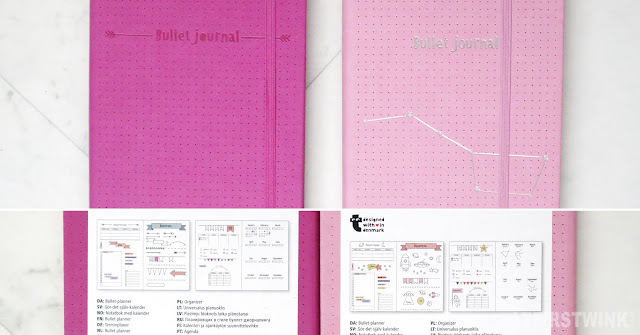 Out of the three colors, I choose the Girlish Peach color. This picture belongs to eSpoir and it was edited by me. In the middle part of the stick, they have added arrows telling you which end is the tint and which end is the lip balm. But it is pretty straight-forward and you don't really need a reminder after you have used it the first time. It has a very pretty pearly cap with very fine gold shimmers and you pull the cap off like that of a lipstick. The lip balm has the shape of a regular lipstick bullet. The lip tint container has a coral pink color, but the lip tint itself is a very bright, milky orange. It has a slightly slanted, brush applicator, which feels very comfortable on the lips. Even though the lip balm bullet looked like one of a pale pink lipstick, it is actually a glossy, transparent lip balm. 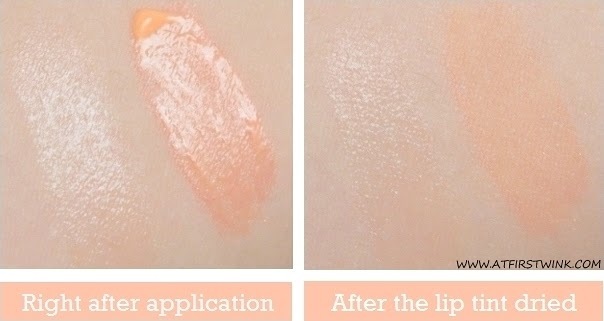 The lip tint looks very milky, bright orange right after application and dries up to a light orange with yellow tones. I first applied the lip tint and it had the cherry scent that most lip tints has. The lip tint actually made my lips look lighter and gave them a visible orange glow. The orange color of the lip tint melts with your natural lip color and creates your personal coral/peachy color that works well with your skin tone. Like with most lip tints, my lips tend to look very dry afterwards and having the lip balm at the other end is very convenient. 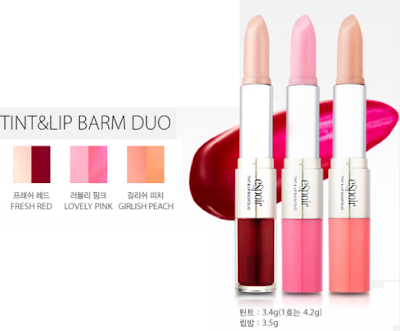 There is no way that you can forget to take it along as it is in the same stick as the lip tint. This eSpoir Tint & Lip Balm Duo didn't disappoint me at all. It gave my lips a really pretty, peachy color and the lip balm has become my favorite one. My lips remained moisturized for the whole day. It is also transparent, so I can use it over and under any lip product and I love the peach scent.